Placement week has arrived. What a breath of fresh air – and I mean literally. Back at the PA we are crammed into one tiny room, fighting for space with the other courses in the building. But placement has bought a wave of much needed change. I have headed to Farmers Weekly for my two-weeks. Today I’ve gone on a fieldtrip to a farm in Oxfordshire. This is my idea of heaven, I love any excuse to wear wellies. We’ve been finding out about a recent outbreak of yellow rust in wheat – gripping stuff. Having to get up at 6.30am to beat the morning rush to get out of London didn’t get me off to the best of starts. The total journey to Oxfordshire took about three hours and half of that was spent sat stationary trying to get out of Clapham South and the other half was made up of me desperately trying to keep my eyes open. However, as soon as we arrived things started looking up. We left the clouds and drizzle back in London and with Storm Doris still two or three days away, the sun was shining on us. We spent the day in a field, observing grasses and analysing the spread of disease. I mainly spent my time taking notes and occasionally nodding my head, hiding the fact the farmers could have been speaking in German for all I understand about yellow rust and fungicides. 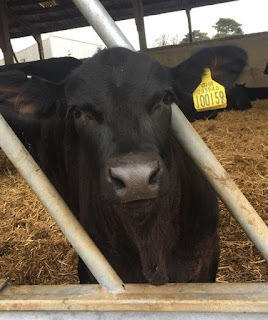 Before we left I got to meet a herd of Aberdeen-Angus cattle. I am usually wary of cattle. I have multiple anecdotes from my childhood that involve me trying to protect my spaniel and myself from these aggressive bloodthirsty vegetarians. However, with a fence in between us, I did actually find myself enjoying the company of the cows and their calves. All in all, a good first week at Farmers Weekly.